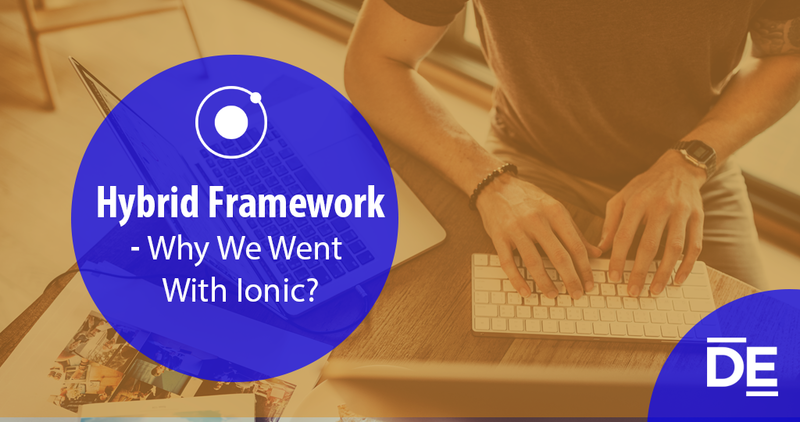 Hybrid Framework – Why We Went With Ionic? Why has it gained the limelight? Why should we use Ionic? An IT industry supported by the trends of start-ups has been quite active on hybrid mobile apps. With numerous hybrid application development platforms available, there starts a rat race for contributing to the clients’ requirements with utmost professionalism and efficiency. It is precisely where Ionic is used by major players like Uniqlo over 47 million views every month. Apart from what Ionic brings to the table, Angular JS is used as a development platform for a different infrastructure of any Web application. However, it has proven its versatility in letting the developers create all-around hybrid applications through the ionic framework. On receiving a prompt acknowledgment from all across the industry, the ionic-based hybrid mobile application has set classic examples of performance, innovation and world-class mobile application development. Ionic is a highly efficient and feature loaded hybrid mobile application development platform. Every leading smart Mobile Application Development Company is always ready with the great features available in Ionic. There are very convenient development and testing features like the ‘Ionic lab.’ It is a substantial reason for motivating you to pick ionic as your next hybrid mobile application development platform. It is a classic feature that will help you bring your partially developed application to different platforms and devices side-by-side to check how it behaves toward viral triggering calls and other operations. It is a great matter of convenience which is mainly supporting developers to complete ionic-based hybrid mobile application development projects very quickly. The significant proportion of cost involved in any mobile application project is the time material cost. When the time is drastically dragged down by the feature loaded Ionic platform, the overall time material cost drops because of the decrease in time. The highly efficient hybrid mobile application development platform is creating an unusual robust hybrid mobile applications which are helping every quality driven mobile application development company in building marvels for mobile. Apart from the essential convenience of development, Ionic is offering all-around compatibility with great plug-ins, many other ready to use packages for several functionalities. It effectively helps you manage smaller repetitive tasks. This further increases the quantum of impact created by ionic on quicker development practices. More than the actual performance figures and statistics, notions are driving several trends and practices in the IT industry. As ionic is using angular JS in its heart, people are expecting it to run faster, be light on development and help them make performance-driven applications. Nascent industry is like mobile application development primarily driven by notions and any transformation creates the first impression on technologies on the board. The same might be the case behind widespread use of iPhone X. However, the time is yet to unfurl Classic opportunity for the mature minds in the industry to discuss and analyze the actual impact on the ground of hybrid mobile application development. Just like any other technology platform, this is speculated to have its maturity curve. Now, the industry will see if this gets to transform into something as mature as Java or remains on the penultimate surface of adoption. Who will Win the Cross-Platform War – Ionic or React Native?